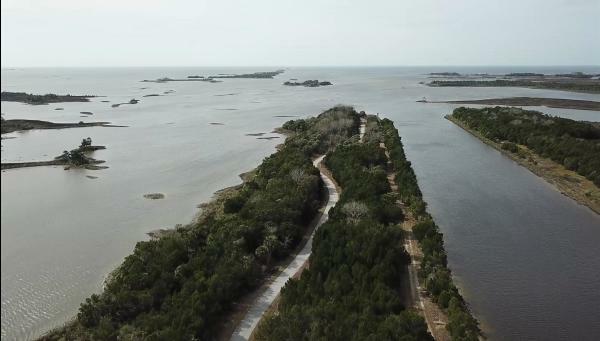 The Withlacoochee Bay Trail, part of the Cross Florida Greenway, stretches five miles from a point facing the Gulf of Mexico to Felburn Park, just east of U.S. 19. The western-most section of the trail is built on a spoil area created by dredging for the Cross Florida Barge Canal - a failed public works project from years ago. The Withlacoochee Bay Trail property includes a 12 foot wide paved multi-use trail suitable for walking, roller blading, or bike riding. The eastern half of the 5 mile span of the trail runs along the south bank of the barge canal. And the remaining trail to the west follows the south berm of the spoil area to its terminus on a peninsula facing the Gulf of Mexico. In addition to the multi-use trail, there is an unpaved road running almost the entire length of the trail. This road is open to public traffic, and provides access to a number of picnic shelters and fishing platforms. Restroom facilities are available in three locations along the length of the trail. Equestrian use is permitted on the unpaved road and side trails. Parking for horse trailers, and for boat trailers, is provided near the entrance off U.S. 19. The westernmost two and a half miles of the trail is probably the most interesting. It traverses scenic maritime hammock and salt marsh habitats. While the spoil areas are not considered to be pristine natural lands, they are home to a large population of nesting shore birds and other wildlife.